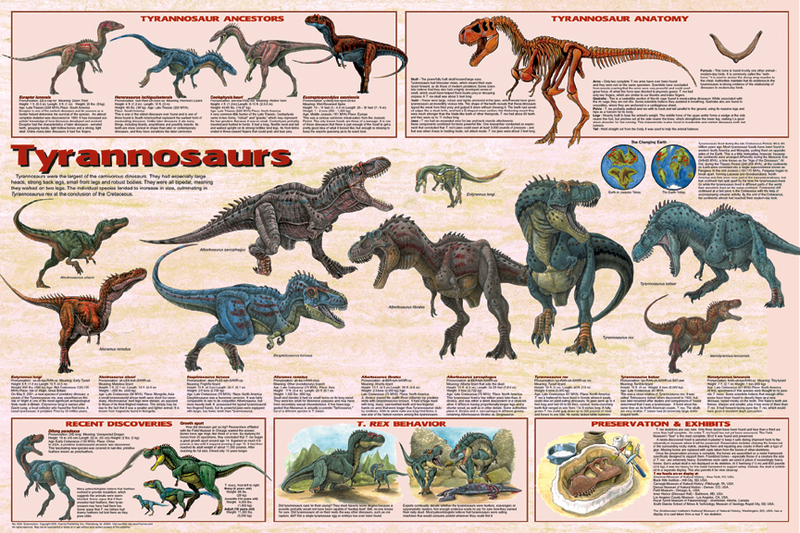 Tyrannosaur Poster - All family members. Lots of info. This is an exciting presentation of an extremely popular subject. The central design consist of magnificently detailed illustrations of all nine members of the Tyrannosaur family tree, all in scale to one another. Above them, insets explore anatomy and ancestors. Across the bottom, there are the latest discovers - the newly found feathered tyrannosaur and the remarkable growth rate proven by researchers. These are followed by social habits and a list of al North American museums where tyrannosaur skeleton fossils are on display. paper using non-fade inks, then coated to provide satin finish and provide protection from UV rays and scratching. Laminated poster is standard poster encapsulated in 3 mil plastic.